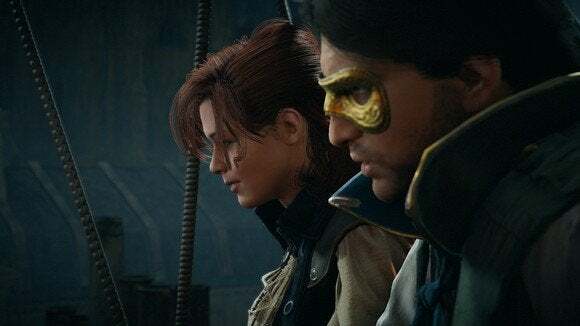 If we're going to relentlessly talk smack about a game, we might as well give credit where it's due: As of today, all of the (awful, who the hell came up with this, I hate you, I hate you, I hate you) mobile app integration is being removed from Assassin's Creed: Unity. All those red and blue and whatever chests that you couldn't open before because they were tied to arbitrary progress in some mobile app you didn't want to use? Yeah, it's all gone. You can just open those chests now, like you're playing a normal friggin' video game. Hopefully this is a sign that Ubisoft has learned its lesson with this kind of garbage. And others too—seeing any sort of "Tie your game to this other mobile account!" message causes me instant aggravation. See also: This Tweet I made about Dying Light. Stuff like this feels forced. It feels cheap. It feels like you're trying to exploit me. Don't do it. And I know, developers—it's probably not your fault. It's some dude in a suit (or wearing a blazer over a t-shirt, more likely). Whoever is in charge of these decisions, look at Ubisoft and maybe...think again, next time the topic arises. Did I ever think I'd be holding up Ubisoft as a role model? Especially for Assassin's Creed: Unity? No. The enemy of my enemy is my friend, though.